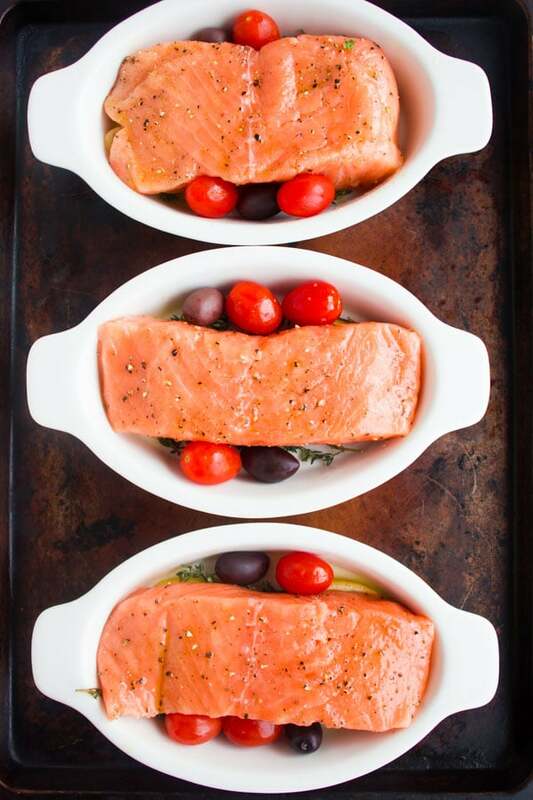 This Baked Salmon recipe is a real dinner party saver! Drizzled with a Greek Dressing while still warm, the baked fish absorbs all those gorgeous Mediterranean flavors. 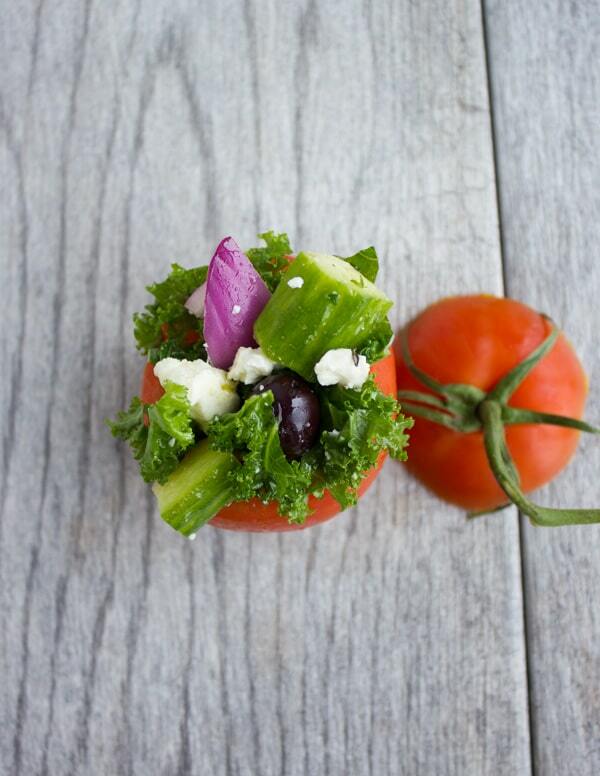 Serve with my Kale Greek Salad Stuffed Tomatoes for an unforgettable feast. 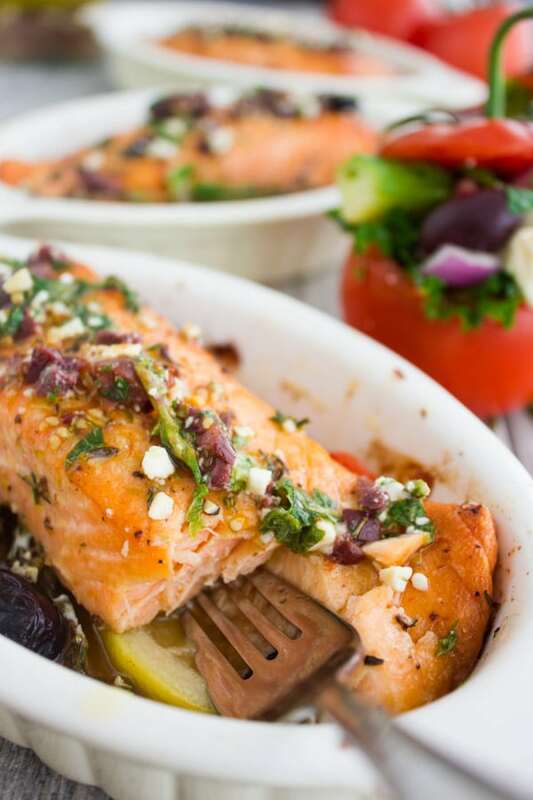 This recipe for Baked Salmon with Greek Dressing is all about the flavors, freshness and convenience! 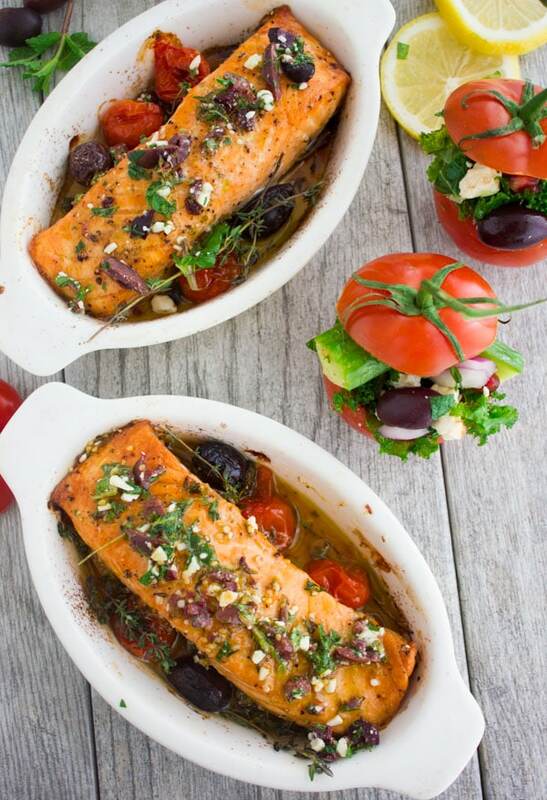 Succulent baked salmon fillets drizzled with a Greek Honey dressing that’s loaded with feta, herbs and olives to brighten up the salmon! Serve them with a Kale Greek salad stuffed in tomato shells for a deceivingly fancy Mediterranean-style salmon dinner you will love! This recipe for Baked Salmon is so special, and not only because it tastes AMAZING and is simple to make, but also because it’s a guaranteed crowd pleaser! And I say that from experience. There’s nothing on the ingredient list that a picky eater could bad mouth! There’s no flavor that stands out, rather a smooth melody of all of our favourite Mediterranean flavors combined. 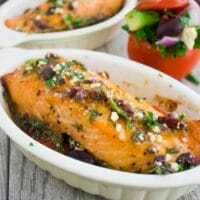 When it comes to convenience, ease and speed, leave it to this baked salmon recipe to impress! 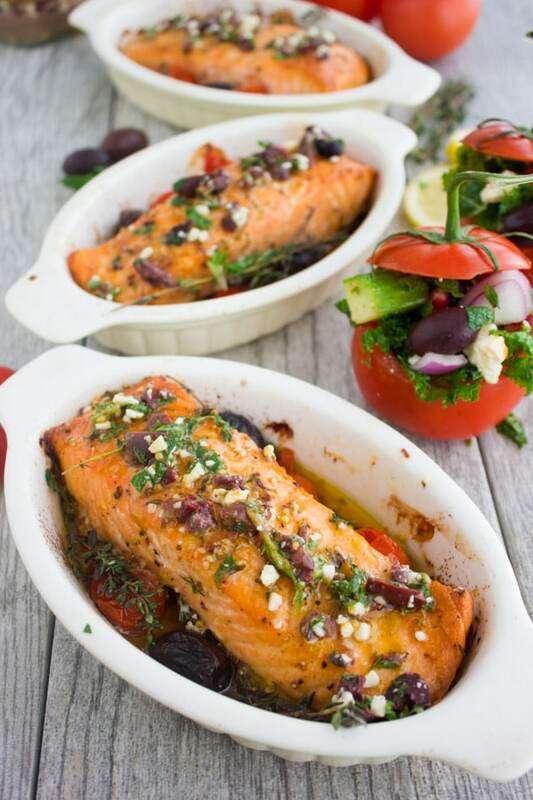 One pan, all ingredients go in together and after 20 minutes in the oven, you’re all good to go – finish your baked salmon fillets off with a drizzle of the BEST honey Greek salad dressing. We drizzle the sauce on top of the already cooked fish so that it gets absorbed better. 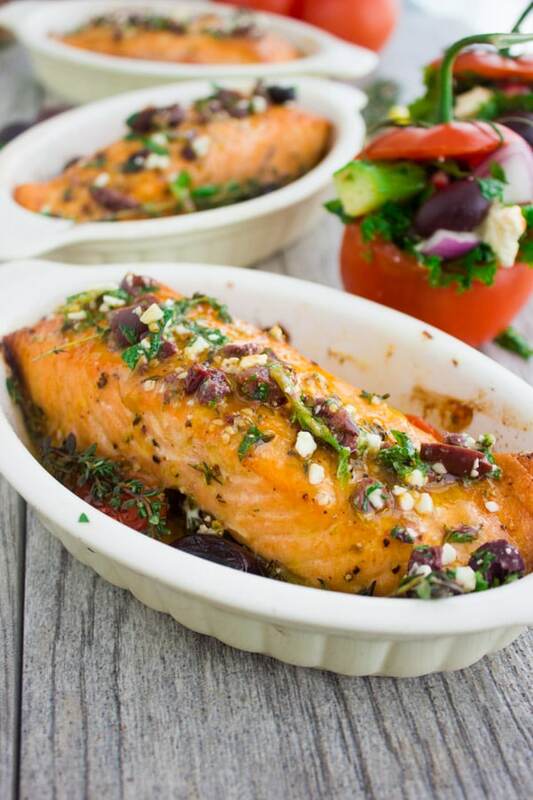 The hot fish allows the dressing to permeate in and become fully infused so that you taste a bit of garlic, lemon, oregano, mint, feta, olives and olive oil with EVERY single BITE of salmon! 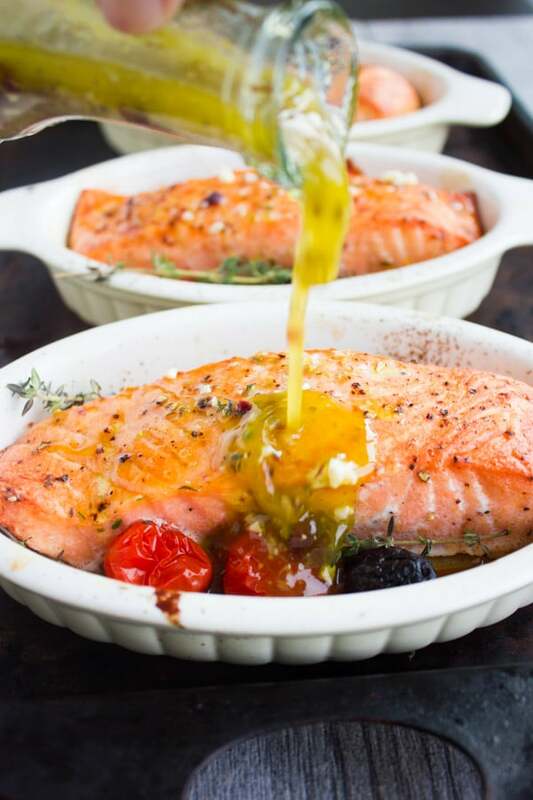 Preheat the oven to 475 degrees F. Season the salmon fillets with salt, pepper and olive oil. Drizzle a ramekin or small casserole dish with a teaspoon of olive oil and arrange some lemon slices, garlic and fresh thyme sprigs on the bottom. 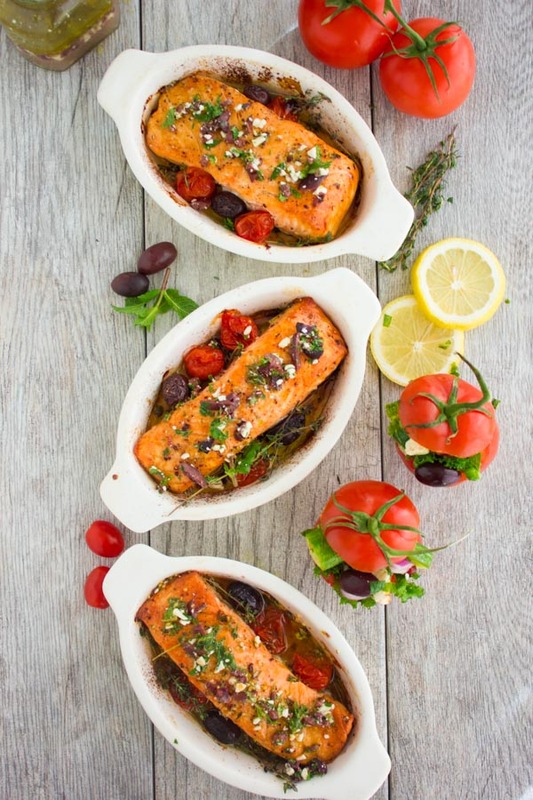 Place the salmon fillets on top and add some tomatoes and olives. Place the ramekins o a baking sheet and bake the fillets for 15-20 mins (depending on the size of your fillets)until the salmon is firm to the touch when you press the center. 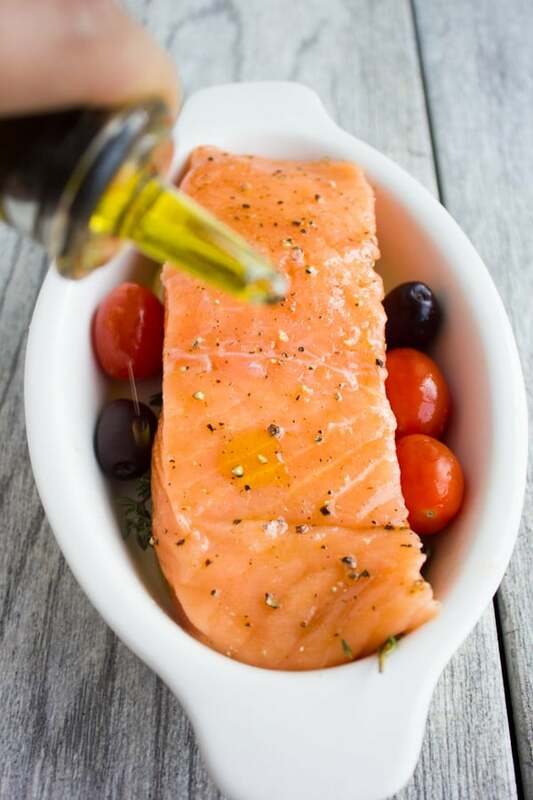 Remove the baked salmon from the oven and drizzle with Honey Greek Salad Dressing while it’s still piping hot. Let’s talk for a second about the fancy looking salad in tomato cups. The photos will best show you how simple they come together. 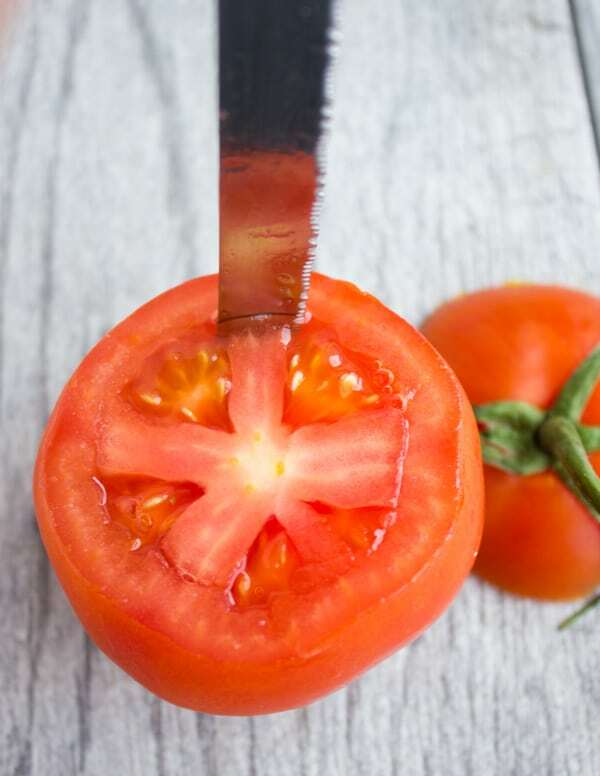 Start by slicing off the top of the tomato, then run a knife around the tomato ligaments inside. With a small metal spoon scoop out the flesh. 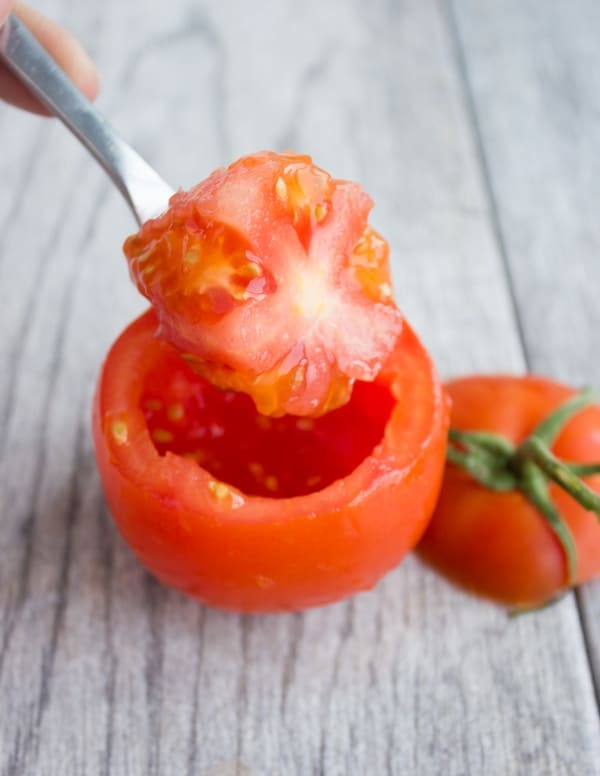 It will resist a little bit at the bottom of the tomato where the ligaments are still attached to the base, so just use your spoon to disconnect that and scoop out everything. In a separate bowl, prepare your Healthy Kale Greek Salad and Honey Greek Salad Dressing with 2 tablespoons extra of fresh chopped mint added in. 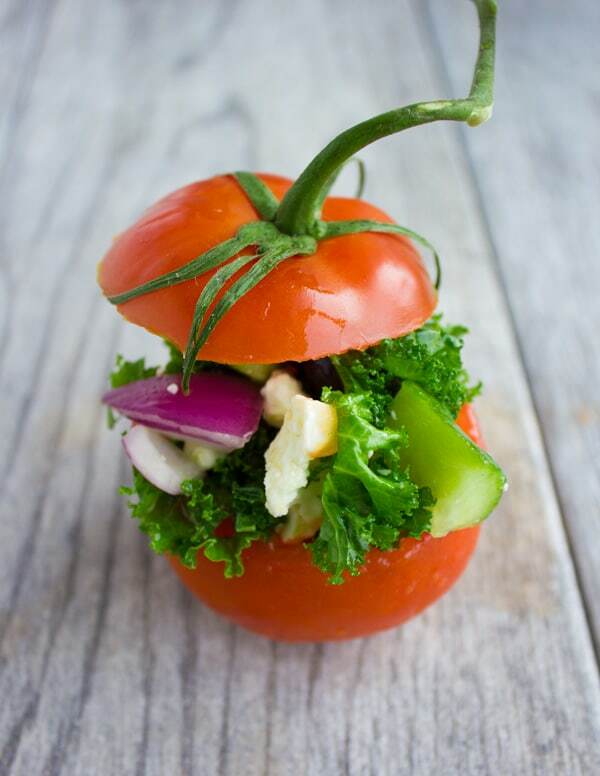 Fill each tomato with 1/4 cup of the dressed up salad and put the cap on top. This is just a sweet way of serving salads and I find it works fabulously for parties or just everyday dinners and adds that touch of sophistication we sometimes look for. Another cute idea for a fall-inspired dinner is this blackberry pecan roast veggie power salad stuffed in an apple! Or this Mexican style lentil detox salad stuffed in tomatoes. Serve this easy baked salmon with my Kale Greek salad for the lightest possible dinner option or with a light quick pasta like this 10 min Greek cheese tortellini, a simple rice side dish, a loaf of crunchy bread to mop up the juices, or maybe these best herb roast potatoes? Make sure to drizzle the baked salmon with the Greek Dressing as soon as it comes out of the oven to allow for full flavor absorption. Check the salmon for doneness by pressing a finger gently into the middle. The fish should feel firm. This Baked Salmon recipe is a real dinner party saver! Drizzled with a Greek Dressing while still warm, it absorbs all those gorgeous Mediterranean flavours. Serve them with my Kale Greek Salad Stuffed Tomatoes for an unforgettable feast. Season the salmon fillets with salt, pepper and olive oil. 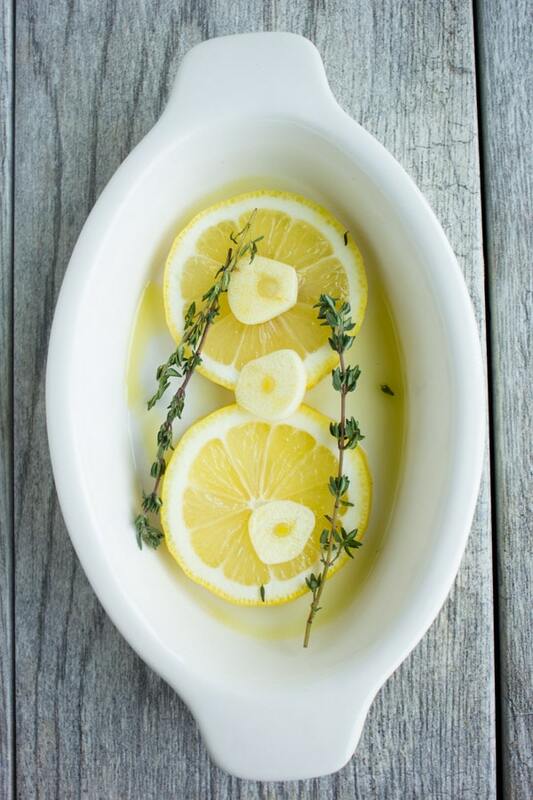 In an oven-safe ramekin or dish, place a teaspoon of olive oil, top it with lemon slices, garlic slices and fresh thyme sprigs. Place the salmon fillets on top. Scatter some tomatoes and olives if you're using. Place the ramekins o a baking sheet and bake for 15-20 mins (depending on the size of your fillets). Until the fish is firm to the touch when pressed in the center. Take out the fish and while it's still piping hot, drizzle 1-2 tablespoons of Honey Greek salad dressing over the top of each fillet ( to taste). I tried this salmon recipe today and it was beyond amazing, super easy, fast and lots of flavor! Really a winnerand super juicy! I’ve been obsessed with all things salmon lately and this recipe is on my list to try! Love that it’s pretty simple to make and is full of greek flavors! So true!! I hope you make it soon! !